Crude oil was little changed near a three-month high after declining as the number of Americans filing applications for unemployment insurance climbed to the most since April. Oil dropped for a second day yesterday and equities fell after the Labor Department reported that initial jobless claims increased by 19,000 to 479,000 last week. U.S. retailers reported July sales gains that missed analysts’ estimates as consumers cut spending. An Energy Department report Aug. 4 showed that crude oil supplies in the Midwest surged to a record as nationwide fuel stockpiles rose. Crude oil for September delivery was at $82.08 a barrel, up 7 cents, in electronic trading on the New York Mercantile Exchange at 9:48 a.m. Sydney time. Yesterday, the contract declined 46 cents, or 0.6 percent, to $82.01. On Aug. 3, oil settled at $82.55, the highest level since May 4. Futures are up 4 percent this week and 14 percent higher than a year ago. Economists forecast U.S. jobless claims would fall to 455,000, according to the median of 43 projections. Estimates ranged from 444,000 to 470,000. The government revised the prior week’s total to 460,000 from a previously reported 457,000. Crude oil inventories in the 15-state U.S. Midwest rose to 97.7 million barrels in the week ended July 30, the highest level recorded since the data started in 1990, the Energy Department report showed. Gasoline supplies increased 729,000 barrels to 223 million, the highest level since April 30. Stockpiles of distillate fuel, a category that includes heating oil and diesel, rose 2.17 million barrels to 169.7 million, the highest level since the week ended Oct. 16. The Organization of Petroleum Exporting Countries will reduce shipments this month as refineries close for maintenance, according to tanker-tracker Oil Movements. OPEC will ship 23.33 million barrels a day in the four weeks to Aug. 21, down 1.8 percent from 23.75 million barrels a day in the month ended July 24, the Halifax, England-based consultant said yesterday. The data exclude Ecuador and Angola. Saudi Arabian Oil Co., the world’s largest state-owned oil company, lowered official selling prices on all crude grades for customers in Asia and Europe for September, and cut prices for light grades to the U.S. The U.S. reduced its forecast for the 2010 Atlantic hurricane period to 14 to 20 named storms, down from 14 to 23, because of less activity than expected in the first two months of the season. Brent crude oil for September settlement fell 59 cents, or 0.7 percent, to end the session at $81.61 a barrel on the London-based ICE Futures Europe exchange yesterday. Crude oil traded above $82 a barrel for a third day after U.S. reports showed service industries and payrolls rose more than forecast in July, signaling fuel demand may increase amid improved prospects for an economic recovery. Oil remained near a three-month high after gaining 7 percent in the previous five days as an index of U.S. service industries grew to 54.3 in July, according to the Institute for Supply Management. Economists forecast the index of non- manufacturing businesses, which covers about 90 percent of the economy, would fall to 53. Crude stockpiles dropped, while fuel supplies rose last week, the Energy Department said. Crude oil for September delivery was at $82.46 a barrel, down 1 cent, in electronic trading on the New York Mercantile Exchange at 10:14 a.m. Sydney time. Yesterday, the contract fell 8 cents to settle $82.47. On Aug. 3, oil settled at $82.55, the highest level since May 4. Futures have gained 14.5 percent in the past year. U.S. companies added 42,000 workers in July, compared with a revised 19,000 in June, according to figures yesterday from ADP Employer Services, a private report based on payrolls. Economists surveyed by Bloomberg News had forecast a gain of 30,000, according to the median estimate. U.S. stocks rose, sending the Standard & Poor’s 500 Index to its highest close in more than two months, after the reports. The S&P 500 climbed to 1,127.24 in New York, its highest closing level since May 17. The Dow Jones Industrial Average advanced to its highest point since May 13. U.S. oil supplies decreased 2.78 million barrels to 358 million, according to an Energy Department report. They jumped by 7.31 million barrels in the week ended July 23, the biggest increase since March 19. Inventories were forecast to decline 1.65 million barrels in the Bloomberg survey. U.S. gasoline supplies increased 729,000 barrels to 223 million in the week ended July 30, the highest level since April 30, the Energy Department reported. They were forecast to drop by 1 million barrels, based on the median estimate of 17 analysts in a Bloomberg News survey. Gasoline inventories were the highest for the final week in July in Energy Department data going back to 1990. Refinery utilization jumped 0.6 percentage point to 91.2 percent in the week ended July 30. Brent crude for September settlement traded at $82.28 a barrel, up 8 cents, on the London-based ICE Futures Europe exchange at 10:11 a.m. Sydney time. Yesterday, the contract dropped 48 cents, or 0.6 percent, to $82.20. Oil traded near a three-month high after breaching $81 a barrel for the first time since May as global equities advanced because of improved prospects for an economic recovery. Crude rose for a third day yesterday after the Institute for Supply Management’s U.S. manufacturing gauge fell less than forecast and companies including HSBC Holdings Plc reported better-than-expected earnings. Asian stocks rose. Oil supplies probably fell by 1.5 million barrels last week, a Bloomberg News survey showed before an Energy Department report tomorrow. Crude oil for September delivery was at $81.51 a barrel, up 17 cents, in electronic trading on the New York Mercantile Exchange at 8:57 a.m. Singapore time. Yesterday, the contract rose $2.39, or 3 percent, to $81.34, the highest since May 4. Futures climbed 4.4 percent in July, the biggest monthly gain since March. Prices are up 2.7 percent this year. The ISM’s manufacturing gauge fell to 55.5 in July from 56.2 a month earlier, the Tempe, Arizona-based group said. Economists had forecast the measure would drop to 54.5, according to the median of 74 projections in a Bloomberg News survey. Estimates ranged from 52.5 to 56. The Standard & Poor’s 500 Index increased 2.2 percent in New York and the Dow Jones Industrial Average rose 2 percent. The MSCI World Index, a gauge of equities in 24 developed nations, climbed 2.4 percent to the highest level since May 13. 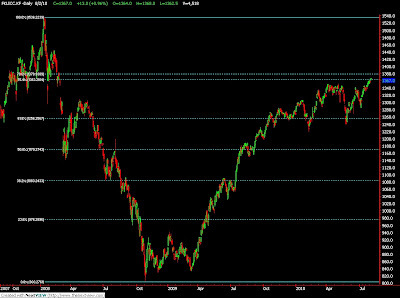 The MSCI Asia Pacific Index gained 0.8 percent to 121.68 as of 9:38 a.m. in Tokyo, set for its highest close since May 5. A tropical depression formed yesterday in the middle of the Atlantic Ocean, the National Hurricane Center said. The system has maximum sustained winds of 35 miles (56 kilometers) per hour, 4 mph less than the threshold to be declared a tropical storm and given a name, according to a bulletin released at about 11 a.m. Miami time. August and September are the most active months of the Atlantic hurricane season. Storms can threaten states along the U.S. Gulf of Mexico which account for 31 percent of U.S. oil output and 43 percent of the country’s refining capacity. Brent crude for September settlement rose as much as 23 cents, or 0.3 percent, to $81.05 a barrel on the London-based ICE Futures Europe exchange, and was at $81.01 at 9:04 a.m. Singapore time. Yesterday, the contract gained $2.64, or 3.4 percent, to $80.82. FCPO 3rd month Oct futures contract traded RM53 higher to close at RM2570 levels as compare to previous trading sessions with a total of 9,462 lots traded in the market. FCPO price traded higher during entire trading session as soybean oil and crude oil both were traded higher during overnight settlement and electronic trading sessions. 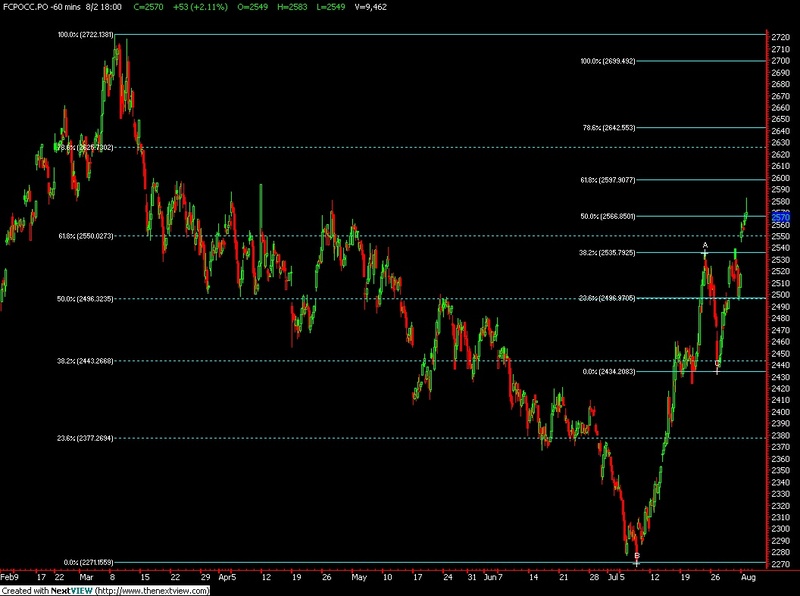 FCPO price penetrate previous resistance levels at RM2539 regions and continue to trade higher to resistance levels at RM2578; 78.6% Fibonacci resistance levels, in the hourly price chart. 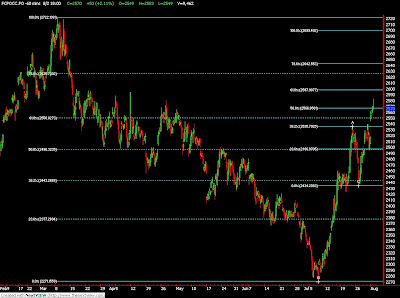 Technically, FCPO price seems riding on a bull rally with resistance levels seen at RM2594 and RM2625 regions. FCPO price must penetrate the resistance levels in order further affirm on FCPO bull trend while support levels at RM2550 and RM2498 must not be violated in the coming trading sessions. FKLI July Futures contract traded 13 points higher to close at 1367 levels as compare to previous trading session to with a total of 4,518 lots traded in the market. FKLI opened higher upon open for trading sessions as Dow Jones futures electronic trading was traded higher while most of the regional indices were traded higher, hence indirectly fueled our market trading north. FKLI basically traded within rectangular formation during intraday trading with support seen at 1364 levels while resistance levels were seen at 1368 regions. 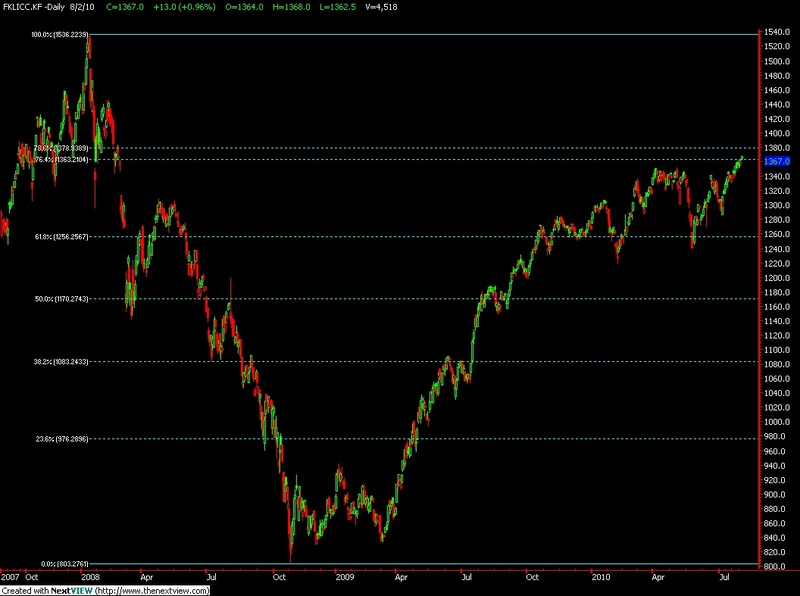 Technically, FKLI seems holding well during trading sessions with support seen at 1354 and 1350 regions. FKLI would encounter some resistance levels at 1371 and 1379 regions based chart pattern of previous triangle formation where objective price seen at 1371 regions while 1379 was 78.6% Fibonacci resistance levels in the daily price chart.